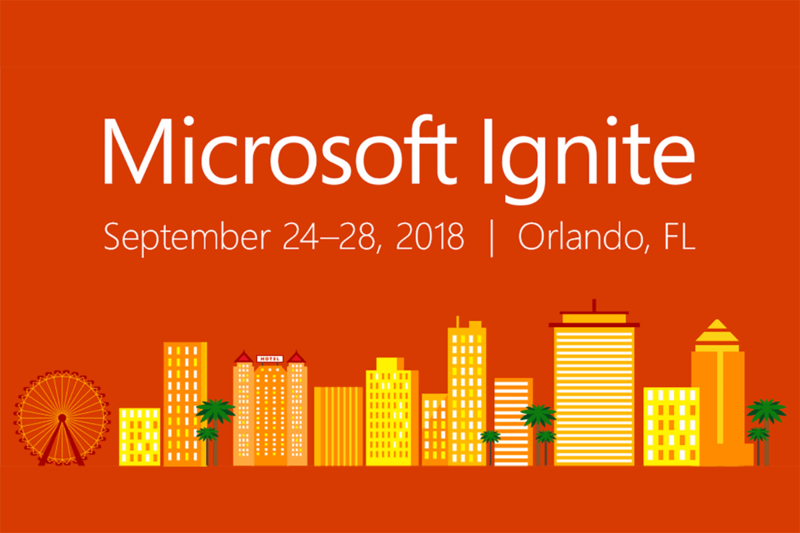 Find this Podcast “Microsoft Ignite 2018 Recap from ThreeWill” on the ThreeWill Soundcloud, Stitcher, and iTunes. Danny Ryan: Hello and welcome to “The Two Bald Brothers and a Microphone Podcast.” This is your host Danny Ryan. I’m here with co-host Tommy Ryan. How are you doing Tommy? Tommy Ryan: I’m doing well. Danny Ryan: Wonderful. And you were away last week at Ignite down in Orlando. Danny Ryan: And been missed talking to you last week, and looking forward to finding out all the stuff that you learned while you were down there, and just have somewhat held off on asking you a bunch of questions, waiting for this time to get your thoughts on things. I did read through this morning your notes from the conference from some of the different sessions that you were able to go to, and I know you met with a bunch of people while down there. How did the week go in general? Tommy Ryan: I thought it went well. As usual it was jam packed, more things than you have time to see, kind of the Disney experience of conferences. They do a good job of giving you different ways to consume the information. They have a hang out area, which I used a little bit more than I did last time. It’s a way to be able to go across a couple of the presentations, so if you’re a little ADD, it’s a perfect place to be. Danny Ryan: So, you sit there and you can see a bunch of different sessions up on the screen? Tommy Ryan: [crosstalk 00:01:25] Yeah, big, long tall wall that has … I can’t remember how many … maybe 14 different presentations going on at the same time. They end up taking presentations that are overbooked, and they get top priority to be shown on that wall, so if you can’t get into a room, you can view it there. Danny Ryan: Do they have something more that you can dial into, which ever one you want to listen to? Or how does that work? Tommy Ryan: They have a transmitter, or a receiver that’s receiving the signals and you can change the channel and plug up your ear phones to it. And they were giving out the Microsoft ear phones, every time you would go there, you could get another pair if you wanted to. So, I got a few for the office. And that was handy, because if you were in a presentation and it just wasn’t going the way you thought it would go, you can jump over to another topic, and you’re not walking down or across the conference floor to get there. Tommy Ryan: That was nice. And, it’s good to go in person. I think the screen is “larger”, with having so many screens up on the wall, it was a little bit harder to see the content. Being in the room itself was good, and also just getting the exercise too, was nice. Danny Ryan: You went down there with Pete and with Kirk, and Linda was able to join you as well? Tommy Ryan: Yeah, yeah. Linda was … she wasn’t at the conference as much as just at the hotel, was just working from the hotel. Came down, we visited some relatives. Danny Ryan: Did you see some family? Danny Ryan: Were those primarily like the SharePoint intranet ones, and development ones? Or which ones were the ones you guys really wanted to make sure you didn’t miss? Danny Ryan: There you go. Tommy Ryan: … to kind of see what’s coming there. Which one I’m looking forward to … I tried to get it set up properly … which is Files On-Demand, and that way you can see a thumbnail of kind of all of your content that’s on one drive, and selectively determine which pieces of content are local. Tommy Ryan: You have to … yeah. As far as Insider build and then you’ve got to go delete some local cache, and I could not find that in the file structure, it wasn’t there, so I installed it and it didn’t work. I don’t think I got the right version. Danny Ryan: It’s funny when you said, “delete local cache.” It sounded like a technical way of spending money on something. Danny Ryan: Delete some local cache. Tommy Ryan: Yeah, just curious. I think you’ve got Selective Sync, so you’ve got that, but Files On-Demand allows you to see everything that’s in your one drive, and it’s not loading the entire set of content, and you can selectively indicate what folders or files will be always on your machine, versus you can see it, and if you click on it and it’s not on your machine, it’ll go and retrieve it for you. But, if you’re offline and you’re on the plane or something like that where you don’t have internet access, you can see that thumbnail but you can’t get to the content unless it’s been forced down as a local file. Tommy Ryan: Yeah, I like the direction that’s going. It takes advantage of what the strengths of Microsoft are and although public facing internet search is not say their strongest point, what they’re known best for, compared to say Google Search. But, all the sources of collaboration content they have across the platform, there is an essential way to search that, so this is the beginning of that, and it not only searches across Yammer and Team’s and SharePoint, which you can’t do today. It also includes public content, so it can be your one stop shop of “I need to find some information”, and that might be internal, it might be external. Tommy Ryan: It feels more like a federated search than a fully integrated search. Hopefully they’ve got control over Bing and control over their tenants in the Cloud, which makes it promising that they can do that, versus trying to mix and match content sources that are some owned by the client with their own infrastructure, and some in the public web, this is all out there in the Cloud that they have control over those properties, so they should be able to make that tightly integrated. Tommy Ryan: No, no, no, no. I was trying to recall what that feature looks like. Tommy Ryan: Yeah, look at LinkedIn and stuff like that. Tommy Ryan: Where it shows up as a federated. Yes, yes. Tommy Ryan: Yeah, I like that, the suggestive bookmarks is a simple feature but it’s a way for your community to suggest, “How can we improve the search experience? I’m trying to find this. This did not show up in the results. I expected it to. So, let me suggest a bookmark.” It’s kind of the best bet of what you have in SharePoint. Danny Ryan: Yeah. What other sessions come to mind when you think about the week or any take aways that you would share with me or others about stuff that you picked up from the week that were little jewels that you would like to share. Danny Ryan: I think for us, as we look at doing platform replacements like with Jive, that we’ve been doing a lot of, is trying to get the similar type of experience in the new environment, I think this’ll help us. Should help us with … Who was I talking to? I was talking to somebody … to Pete about how far along Modern Pages has come. No, it was Kirk the other day. Kirk and I were talking about this, and it’s a critical piece I think for us that needs to be put in place, and I think we are at a tipping point in seeing … We’re getting some customers coming to us where they might have used somebody else for the migration, and then they don’t like the experience, and they’re looking to us to make a better experience, whether it be more responsive or using probably some of the modern features of SharePoint and Modern Pages. Tommy Ryan: Yeah, and I think that’s where we want to be, and we’ve been a little … I don’t know if frustrated is the right word, but anxious to get to that point where we’re able to do more in SharePoint that is solution oriented versus just migration focused. And, where you feel like you are giving them a better experience, or at least a experience that’s as good as. There’s some things out there that are going to round out the UI and give you some of those things that you see today, like Parallax and things that you already see today in terms of their layouts or have better design principles implemented, so it puts people in the right direction. Danny Ryan: It was interesting to see, and reading through your notes, I think it was you that put this note, was about Yammer, and maybe we should look at just to know what’s going on with it. Tommy Ryan: Yeah, you have a central feed. [crosstalk 00:15:31] Yeah, you don’t have that central feed. Danny Ryan: Yeah, you don’t have a central feed just to let people know what’s going on, and if they want to follow you they can, if they don’t then … This is … it’s a little bit more of a … I feel like I’m pushing it to the world, which I don’t think people really … I don’t like feeling that way, like you have to read this to get where you’re constantly seeing what my updates are there. That’s one thing. The other thing is the tagging, is having some way of putting something out there that the people can find things based on tags, and right now I’ve got to think about it and put it in the right channel, and I don’t have a way of … tagging comes to more of a way of putting multiple tags inside of something, because it may have to do with multiple things, and then a way to find it later on. Right now I’m using pretty much free texts search to go find something. I want to see what you guys talked about for Ignite, like just this morning I’m using more of, “Okay, just search for Ignite and see what comes up out there.” I’m not going to a tag or anything like that, where as it just allows for I think to organize things in a way that you can find it easier later on. Tommy Ryan: I didn’t go to a lot of Yammer sessions. And, from what I see with Yammer, one, their announcement the Yammer’s, now there’s a modern experience web part for Yammer. So, if you’re going down the modern path, you really didn’t have a good way to integrate Yammer, now you do. That’s a positive thing. I think there’s still plain text, I think some of the limitations that is has is still there. I think they’re still talking about a better integration with content with Yammer. It doesn’t have the experience they have with Teams, where you bring up the file, and then you’ve got on right-hand pane, a list of comments that are associated with it that are social comments that you have with Teams. They said they’re working on that. They had that, and they pulled it, and it sounded like it was a patent issue in terms of how they approached it, so maybe there was a technology implementation that was patented I guess. I might have mis-heard that, but the intent is to get that back in to have the ability to have comments tied to the content, so if you do have some Yammer conversations around a piece of content and you’re a tenant, that will become available if you went to that information directly. This gives you in one flow of @MentionDanny, I put in the comments, “It’s contextual, not just to the document, to an element that’s in that document.” It’s within the document, it’s self-contained, so where ever you move that you don’t break the linkage. If you move a document within Teams, you’re going to break the linkage to those comments. It’s interesting. It gives yet another way to think about how can I collaborate? When Yammer has comments tied to the document, I’d be interested to see how that surfaces, how that comes together. Tommy Ryan: And they’ve got the document and all the metadata and everything about it. We don’t have to worry about migrating it to them or packaging it for them, it’s there. And, from a data security, and GDPR and all that kind of stuff. Danny Ryan: They’re controlling that content. Tommy Ryan: They’re controlling this within their tenant, we don’t have liability there, so that’s our preference, is put it in their tenant. Right now I’m using To Do lists, and a lot of the stuff I’ve the stuff, I’ve also been doing a lot of browser based, so you saw the new Outlook experience, which I think is great. I’m basically grabbing the context, so I’m in Microsoft Teams, somebody @Mentions me, I’ll actually highlight that thing, and then send it To Do list as a to do item and then mark it up and say, “I’ve got to follow up on this tomorrow.” And they that link itself is back to Teams. So it pulls me back to the context that I need to go do what I need to do. That workflow’s been good for me. I think Microsoft … I’m like, “Microsoft, you’ve got such a great opportunity for people to … ” They’re trying to get work done in the way that a lot of people … I would think the calendaring stuff is rock solid. There’s just a missing piece there with, somebody @Mentions me, why can’t I just create a To Do item out of that and add it to my To Do list. It seems like that’s productivity, that is what people really want. I know you went to a session, and they’re coming along. They are coming along, but I think they’re throwing loads of developers at it or anything where we going to see something significant change any time soon. It frustrates me. I’ve dealt with it, I’ve moved on. I’m using what works for me, but really it would be great to see them invest in this and make it happen where you can create in context To Do items for things that you’re trying to get done. Tommy Ryan: Right. Yeah, I think the Vision is the one place you go for all your tasks across the platform. They’re moving in that direction, but very, very slow. I feel like the things that I saw, it was almost a repeat of what I saw last year. There’s some progression, there is some … We’re going to start seeing the task area of Outlook become To Do. There’s the ability to drag and drop items into your task list from Outlook context, and kind of link backs to get to, “Okay, where did this task come from?” It’s something that you feel like could have been done a while ago, and not sure why. I think they’re putting more energy into Planner than they are To Do, because I think Planner is that organizational task management, and To Do is the personal side. I’m not sure why. It just seems like it’s a great place to lock people in. Danny Ryan: It gets to their mission. I mean this is empower every person. A part of empowering somebody has to do with giving them control over what they’re doing. How do people do that? They do that by planning out what their day looks like. Maintain control over what’s next for them to do, what are they prioritizing? I know that Satya, he loved Wunderlist, it was his favorite app … at one point in time he was talking about how that was his favorite app. I know he’s got his eye on it. It just seems strange. Danny Ryan: From a productivity thing. And you go look at the forms and they know what’s going on, they know. People basically want all the features of Wunderlist, so it’s frustrating. Along with that, there’s so many other great things they’re doing, don’t throw the baby out with the bath water. For us, you look for a work flow that works for you, and you just keep an eye on things, and see how things progress, and that’s the way you handle these types of situations. Well, it’s great to have you back and look forward to … I know we’re going to do some lunch and learns and stuff like that from the sessions, and look forward to learning more about what went on out there, and appreciate you sitting down and sharing with the listeners more of what’s been going on. Thanks for doing this Tom. Danny Ryan: Thank you everybody for listening, and have a wonderful day.